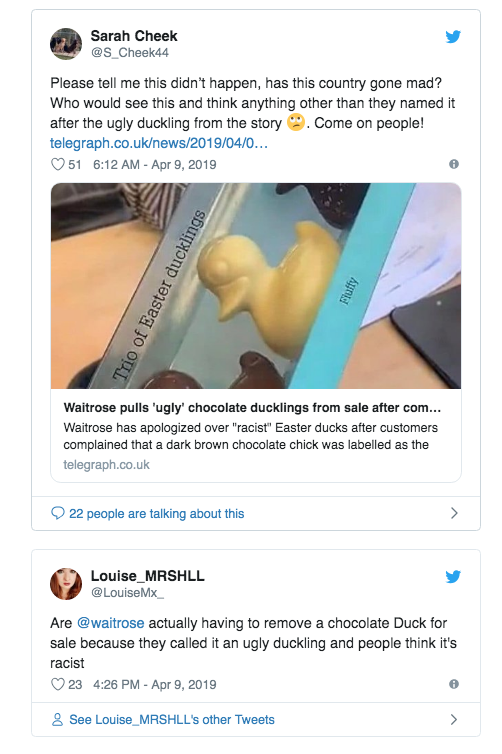 British grocery chain Waitrose has been forced to apologise after customers complained it was selling “racist” Easter eggs. The confectionary in question came in the form of three chocolate ducks, including a milk chocolate one called “Crispy”, a white chocolate one called “Fluffy”, and a dark chocolate version called “Ugly”. However, customers have taken to social media to express their dismay of dark being associated with ugliness. 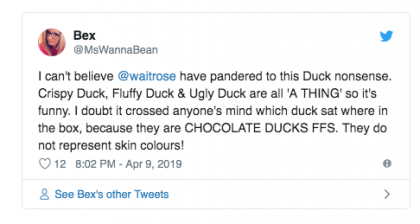 However, not everyone was quick to jump on the racism bandwagon, arguing the duck’s name comes from Hans Christian Anderson’s famous children’s fable The Ugly Ducking. While others simply thought the whole thing was a pointless beat-up. For its part, Waitrose recalled the product and had it repackaged before returning it to shelves. A spokesperson added: “We are very sorry for any upset caused by the name of this product, it was absolutely not our intention to cause any offence.